Explore traditions, tours, and other ways UNC and its community make amazing experiences! UNC’s campus is dominated by two central quads, McCorkle Place and Polk Place, both brimming with students, academic buildings and campus activities. Be sure to visit campus features uniquely distinct to UNC like the Pit—a sunken brick courtyard shaded by two large Overcup oaks, which serves as the main hub for students gather to meet, eat and debate on campus. Flanking the Pit are the Student Union and Students Stores, a great place to pick up a Carolina memento or enjoy a cup of coffee. 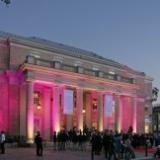 Adjacent to this hub is the grand Wilson Library, an enduring monument to education since 1929. 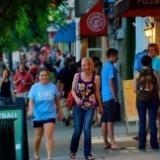 Learn more about UNC Chapel Hill. UNC’s alma mater “Hark the Sound” refers to Carolina as a priceless gem, which is easy to understand once you first walk through UNC’s idyllic landscape, you’re surrounded with blooming with azaleas and dogwoods and numerous historical buildings and landmarks. The Old Well, located in the heart of UNC’s, has been an enduring symbol of Carolina pride for decades. More recent landmarks include the Unsung Founders Memorial, built in 2005. This bronzed and stoned memorial sits inconspicuously in front of the Alumni Building as homage to the men and women of color - enslaved and free - who helped build Carolina. UNC’s athletic program is as steeped in tradition and excellence as their academic programs. The athletic program prides itself on having loyal fans, affordable tickets and producing some of the top athletes in the nation—Mia Hamm and Michael Jordan to name a few. Be sure and visit the Carolina Basketball Museum for a slice of Tar Heel college basketball history. 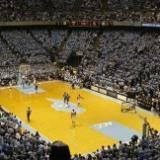 To buy tickets or learn more, visit UNC's athletics page. Game Day Tar Heel Express Park & Ride Lots. Thousands of people commute into Chapel Hill each day—it is essential to know the key visitor parking areas on UNC’s campus to ensure a pleasant experience while visiting UNC. There are a total of six visitor parking areas; Dogwood Parking Deck, Morehead Planetarium Lot, Rams Head Deck, Highway 54 Lot, the Ambulatory Care Lot and the Swain Visitor Lot. Parking rates are $1.50 and $1.75 hour depending on the lot or deck. Learn more about lot locations.